Facing a deadline that threatened a federal shutdown, the House passed the Consolidated and Further Continuing Appropriations Act, 2015 (H.R.83) on Thursday 11 December with three hours to spare. The Senate followed suit on Saturday, passing the spending measure and sending it to the President for his signature. Disagreement over the policy riders in the bill forced the final vote in the House to be delayed for a time. The delay prompted an uncharacteristic lobbying from the White House to rally support for passage of the legislation. The $1.014 trillion “CRomnibus,” a forced marriage between an omnibus spending bill and a continuing resolution (CR), funds most of the government until October 1, 2015. The Department of Homeland Security (DHS) is funded under a CR until March 2015. The shortened time frame for the DHS budget is a gesture by members as a protest against the President’s executive order on immigration. Senate approval came comparatively quickly, following House passage. President Obama has already communicated to sign the legislation. Below is a summary of key provisions of the Cromnibus. While legislative gridlock was the hallmark of this session of Congress (and no major energy/drilling legislation was passed into law), some lawmakers used the CRomnibus to advance their specific agenda items. Included in the budget bill was a provision that prohibits the listing of the Greater Sage Grouse on the Endangered Species List. It remains to be seen, however, if the prohibition will be long term, since this provision of the CRomnibus expires Sept 30, 2015. The bill provides $34.2 billion for Energy and Water Development and Related Agencies, $142 million more than the fiscal year 2014 enacted level. $122 million for water resource studies. Provides $1.13 billion to support USBUR water resource programs. $50 million to address the exceptional drought in the Western U.S.
$19 million for WaterSmart grants, including feasibility studies. $37 million for Bay Delta Program. $57 million for Central Valley Restoration Fund. $13 million for R&D related to desalination and water purification. $21 million for Title XVI project construction assistance. $2 million to address invasive quagga and zebra mussels. Within the explanatory section, the Bureau is directed to use all means available to address the drought. $3.7 billion for applied energy programs, this amount includes $280 million ARPA-E program. $571 million for fossil energy research programs, a $8.9 million boost over 2014. $1.93 billion for Office of Energy Efficiency and Renewable Energy programs, a $25 million increase over 2014. Blocks funding for the Administration’s Green Climate Fund. Rescinds $6.6 million from the Department of Energy’s “clean coal technology” program that remained unspent from last year’s appropriations. S. Bureau of Land Management – $1.1 billion, $14 million increase over 2014 enacted. S. Geological Service – $1.045 billion, including $34 million for the USGS National Streamgage Program and $2.6 million for the National Groundwater monitoring Network. S. Fish and Wildlife Service – $1.4 billion, $12 million increase over 2014 enacted. Povides $8.14 billion for the U.S. Environmental Protection Agency, $60 million less than 2014. $1.45 billion for the Clean Water State Revolving Fund and $906.8 for the Drinking Water State Revolving Fund. $2.2 million to provide the agency with staffing resources to begin the process of implementing the WIFIA program. $47 million is provided to support funding for enhanced real time monitoring of coastal and estuarine water quality related to areas impacted by extreme weather events. No further Buy American Mandates. $91 million is provided to support cleanup of Leaking Underground Storage Tanks (can be used to address groundwater contamination). Federal Transit Administration – $2.3 billion, an increase of $141 million over 2014. Federal Highway Program – $41 billion (as authorized under MAP-21). $8.6 billion in state and local transit grants from the Mass Transit Account of the Highway Trust Fund. Includes $2.1 billion for Capital Investment Grants and $172 million for Small Starts and full funding for all current Full Funding Agreement Grant projects. Federal Railroad Administration – $1.6 billion, an increase of $23 million over 2014. No funding is provided for high-speed rail. $500 million for the TIGER (Transportation Investment Generating Economic Recovery), a decrease of $100 million from 2014. No funding is provided for TIGER planning grants. Requires the Department of Transportation to release oil-by-rail safety proposal by January15, 2015, two months earlier than current time frame for completing the rule. Provides $3 million for more inspections along crude oil routes and funding for 15 extra inspectors to focus on hazardous materials shipments such as fuel. Taking a page from his earlier initiatives to address the nation’s infrastructure funding needs, Representative John Delaney (D-MD) introduced the American Infrastructure Fund. The legislation would impose a preferential 8.75 percent tax on corporate profits that are outside of the U.S. tax code’s reach. Any corporation that took advantage of the lower tax rate would see the tax receipts from the tax used to issue assistance for road and transit projects. The proposal is estimated to raise approximately $100 billion or enough funding to meet the Highway Trust Fund’s needs for six years. In addition to the highway funding, the legislation would dedicate $50 billion to support all manner of public infrastructure presumably including water infrastructure. This latter effort mirrors Delaney’s previously introduced infrastructure bank bill. Delaney’s decision to introduce the bill in the final hours is a clear indication that support for tackling tax reform and infrastructure investment may be a symbiotic relationship in the coming Congress. For more on these and other activities of the PGRA division, please contact Bill Tanner at Bill.Tanner@iadc.org. Multimedia presentations and other materials generated as a result of the National Oil Spill Commission’s (OCS) investigation into the Macondo event can now be accessed via the IADC website. This new section features a 10-minute video summarizing the event as well as time lines, graphics, reports and other materials dealing with the history of offshore oil exploration, the event itself, and the eventual response and restoration efforts. IADC agreed to archive the OSC materials at the request of Oil Spill Commission Action, a follow-up group to the National Commission that was established to ensure the nation can move forward with offshore drilling and production in a safe and environmentally responsible manner. For more information, please contact Steve Kropla at Steve.Kropla@iadc.org. The US Environmental Protection Agency (EPA) is proposing revisions and confidentiality determinations for the petroleum and natural gas systems source category of the Greenhouse Gas Reporting Program. In particular, the EPA is proposing to add calculation methods and reporting requirements for greenhouse gas emissions from gathering and boosting facilities, completions and workovers of oil wells with hydraulic fracturing, and blowdowns of natural gas transmission pipelines between compressor stations. The EPA is also proposing well identification reporting requirements to improve the EPA’s ability to verify reported data and enhance transparency. This action also proposes confidentiality determinations for new data elements contained in these proposed amendments. Comments to the EPA must be received on or before 9 February 2015. To have IADC comment on your behalf, please submit comments to Rhett Winter at Rhett.Winter@iadc.org no later than 2 February. API recently published API Recommended Practice 2D, Operation and Maintenance of Offshore Cranes, Seventh Edition. It establishes general principles for the safe operation and maintenance of offshore pedestal-mounted revolving cranes on fixed or floating offshore platforms, offshore support vessels, jackup drilling rigs, semi-submersible drilling rigs and other types of MODUs. The document provides requirements and recommendations for personnel training, lift planning, pre-use inspection, and testing of temporary cranes that are erected offshore. For more to information and to purchase, please visit API’s Publications website. Additional stand-alone chapters of the 12th edition of the IADC Drilling Manual have been issued in electronic form and are available for purchase via the IADC Bookstore. Drilling Practices is a straightforward explanation of the causes of troublesome drilling problems and how to avoid and overcome them. This chapter, absent from the previous versions, provides a sweeping discussion of numerous important downhole tools. Content includes details on borehole enlargement; circulating subs; downhole mud motors; air hammers; rotary steerable systems; vibration; torque and drag; measurement while drilling; logging while drilling; wireline logging; and jars. The eBooks are compatible with most eReaders, including DL Reader (mobile devices), BlueFire, Adobe Digitial Editions and more. Hard copies of the 12th Edition of the Drilling Manual are expected to be released in 2015. On 11 December, IADC representatives met with the Texas Railroad Commission in Austin to discuss Rule 13 issues on behalf of the drilling industry. Rule 13 deals with the Casing, Cementing, Drilling & Well Control, and Completion requirements set forth by the Texas Railroad Commission. Talks are expected to continue in early 2015. 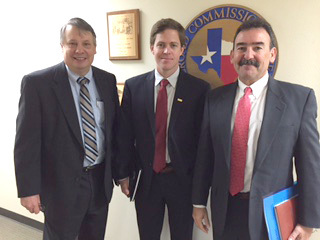 IADC meets with Texas Railroad Commission on behalf of industry. Left to Right: Bill Tanner – IADC Vice President, Government Affairs; Rhett Winter – IADC Director, Onshore Operations; and Mike Garvin – Sr. Vice President, Patterson Drilling Company and Chairman, IADC Onshore Advisory Panel. For more information, please contact Bill Tanner at Bill.Tanner@iadc.org or Bob Warren at Bob.Warren@iadc.org. The first meeting to initiate the revision of API RP 54, Occupational Safety for Oil and Gas Well Drilling and Servicing Operations, will be held on Thursday, 15 January. The meeting will be held at the PETEX Learning and Assessment Center in Houston. To participate, please contact Roland Goodman of API at goodmanr@api.org. The January/February issue of Drilling Contractor, available in early February, will feature key executives across the industry discussing current critical issues. In the new issue, senior level management from a variety of key industry companies provide a wide-ranging view of issues that are driving operational and investment decisions heading into the new year. Leaders representing Atwood Oceanics, KCA Deutag and Precision Drilling discuss solutions to drill wells more efficiently and to reduce the cost of drilling. Among the operator community, Continental Resources, Petrobras, Shell and Statoil executives provide perspectives on enhancing production in complex environments, the regulatory environment, safety practices and more. The print edition of the magazine will be available in early February, and full content will also be accessible online. Previous issues of the magazine can be found on the Drilling Contractor Magazine website. Unit Texas Drilling LLC: Rig 316 (1).